I am one of the designers of this website and before I started the work of creating the site, I first wanted to create a daily practice of reading the Sai Satcharitra to get Baba's blessing and direction as I started the design. So I would read the Satcharitra every day and ask his blessing to work through me to create a beautiful site that would bring all of his devotees closer together, where we could share his leelas and miracles in our life. There is one section of the book that shares many leelas involving Baba and rupees. Often time he would give his devotees rupees that they would keep and add to their altars and often times the number of rupees he would give signified something important to them or contained a message and other times he took rupees from his devotees for the same reason. About 2 weeks into the creation of this site and the time I was reading all the rupee stories, I was getting out of my car and something shiny caught my eye on the floor. I bent down to investigate and lo and behold it was a 2 rupee coin. It should also be mentioned that not too long before this I had turned my car upside down looking for something under the chairs. If there was a rupee, I would have found it then. It should also be mentioned that I live in Texas and while I have been to India that was over a year (and many car washes) ago. It was such a nice message letting me know he was there with me, guiding me in this creation of the site. It's hard to say how touching these moments are because they're just so sweet. I also feel the significance of the 2 rupees was that of "faith and patience". I thought that's where the story ended but then a couple weeks later my friend brought her kids over for the first time. 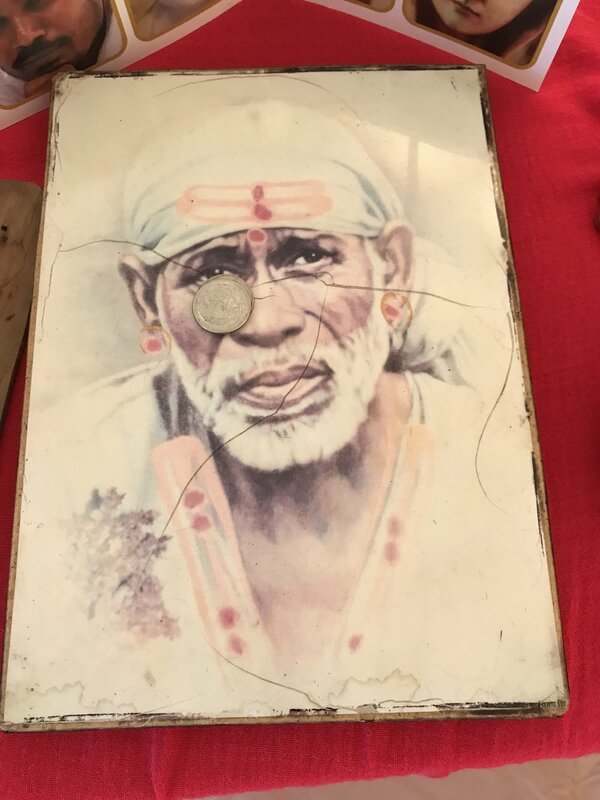 They were very curious about my altar and I saw her little boy take 2 quarters out of his pocket and put them on a picture of Baba. He walked by and told me casually, "I left two quarters for him." This was just another reminder/reflection of how we are all connected and also just the pureness of children to recognize the Divine.